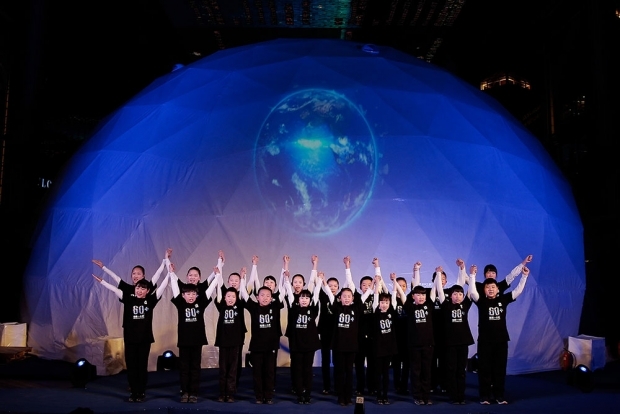 A children’s choir sings during Earth Hour on March 29, 2014, when Beijing’s Central Business District turned off its power. Earth Hour was begun in 2007 in Australia by the World Wide Fund for Nature, an NGO that now has nine offices around China. Unless there is a radical, and, at this point, unlikely change of heart in Beijing, this year will see the passage of a draconian new law to govern the activities of foreign NGO’s in China. If the draft currently in circulation becomes law, it will have the capacity to impact a wide variety of organizations and activities, Chinese as well as foreign. Operating in China has never been straightforward: a majority of Chinese social organizations operate in a grey zone because the requirements of legal registration are too onerous. Some register as businesses; others simply operate without a license, relying on the goodwill of local officials. Many depend on grants and donations that come from overseas, but are unable to open and operate official bank accounts. This sector is likely to be hard hit as the foreign organizations that have supported and worked with them find themselves squeezed out. The government has long had an ambivalent view of the non governmental sector: it recognizes that civil society organizations, be they development, educational, environmental or health charities, philanthropic foundations, policy, technical or scientific entities, have contributed immeasurably to China’s development in the past thirty years, through the sharing of expertise, knowledge transfer, training and funding. At the same time, at least some elements of the Party-State appear concerned that organizations not directly under the Party-State’s control offer an actual or potential challenge to its authority. Despite decades of trust building and solid achievement, foreign NGO’s now find themselves at risk of being seen as a herd of Trojan horses: they may look benign, in this view, but they are suspected of infiltrating Western values and ideas into China, and of giving support to those Chinese citizens who may seek the transformation of the Chinese state into a more open and accountable model. Even given that these concerns are not new—and appear to be shared by both Vladimir Putin and Nahrendra Modi—the draft law is unfriendly to a whole range of activities and to the future of independent civil society. Chinese NGOs are regulated by the Ministry of Civil Affairs; should their foreign counterparts, who are often also their partners in joint projects, wish to register legally in China, they will come under the authority of the public security authorities. In addition, they will require the approval of two official sponsors who would be expected to exercise a continuing supervision of their activities. If a foreign entity does not wish to register, but only to carry out activities—educational or training workshops for example, either alone or in partnership with a Chinese organization—it will require a permit in advance from the public security authorities. It will no longer be legal for Chinese individuals or organizations to receive funding from non-Chinese NGOs, unless the foreign entity is registered in China. Even if registered, a non Chinese NGO would not be permitted to recruit volunteers or set up branch offices. It would be obliged to submit its plans and budgets for the year ahead, both to the security authorities and to its legal sponsors. No activities outside the plan would be permitted. Even with this high degree of supervision, the draft law gives the security authorities the right to enter premises, interrogate individuals and seize materials, without offering firm safeguards against the abuse of these powers. For Chinese entities that have worked with foreign counterparts, the burden of bureaucracy and potential risk is now much higher. Many organizations already report that longstanding partners are cancelling plans, and once flourishing relationships are cooling off. The impact of the law may well be that organizations that have worked in China for many years decide to pull out, not because they have any ulterior purpose, but because the burden of compliance is to high. The impact on grass roots Chinese organizations that have benefitted from foreign funding could be dramatic. The draft law manifests a suspicion of the activity of foreign organizations that many will find troubling at this stage of China’s development. How the law will be applied and what kind of organizations it is aimed at is hard to guess. If the trend of current policy on domestic civil society is a reliable guide, organizations that focus on service delivery in uncontentious areas—child welfare, for example, or care of the elderly—may find their work continues as before. Those that are active in policy, however, even where that policy is not directly concerned with such issues as rule of law or human rights, risk finding themselves in a cold climate indeed. If that is the result, both sides will be the poorer. Isabel is dead on. I’ll just expand on a few of her points. In recent years, Beijing has become increasingly concerned about the perceived “infiltration” of “foreign” values and organizations deemed detrimental to interests of the one-Party state. Official pressure on domestic and foreign civil society organizations has increased as a result. The new draft law is but the next logical step in escalating this pressure. Those who work on China issues will naturally think of the potential implications of this law on the work of established foreign and domestic NGOs who do work in China on a range of legal, environmental, or societal issues. Many are justifiably concerned that this will lead to a further closing of space for such groups to operate in China. But there is also a much broader range of foreign organizations that could potentially be implicated by the draft law and have not even considered it. a) The non-profit college alumni organization that organizes educational tours on the Yangtze for its members. b) The international scientific association that wants to rent out a resort in Hainan for their annual conference. c) The American high school band group that plans to go to Guangzhou next year to conduct a performance. d) The volunteer medical group that sends individual doctors into China to conduct small training sessions for nurses. b) have a Chinese partner willing to go through the temporary permit process to obtain advance approval. Currently, many of these groups rely on Chinese individuals, companies, or associations to provide required letters of invitation for visas (such as the F or M visa) or they simply provide travel booking information and obtain a tourist visa. Both of these are quite different from the quasi-sponsorship requirement envisaged under the draft law (i.e. the temporary registration process). One of the major risks here is that some foreign individuals and organizations may just decide that it is too much trouble to carry out their activities in China, and simply move to another country instead. That American high school band group, for example, might find locating a partner organization willing to go through the approval process with public security authorities too complicated. Instead, it might decide to go to France or Vietnam instead. Play such trends out far enough into the future, and people-to-people contacts—one of the core elements that have contributed to building positive, healthy relationships between China and the rest of the world in the reform era—could be seriously damaged." Over the past decade, in addition to being an openly gay Chinese lawyer working on legal issues related to sexual orientation and HIV/AIDS, I have been an activist persevering in the tumultuous uncharted waters of civil society, where major players are international foundations, domestic charities, and Chinese governmental authorities such as Civil Affairs bureaus and the security apparatus. In China’s politics, the third sector, another name for civil society, is the “third rail.” It is no secret that activists are monitored, and advocacy groups are under surveillance by security authorities, if not closed down (yet). What’s worse, in recent years, a staggering number of activists and advocates have been criminally arrested and sentenced. Of those, a few were, in part or in whole, funded by foreign foundations and other nonprofit institutions. Now the Leviathan in a murky and stormy sea is aggressively marking a boundary and setting a code of conduct for foreign nongovernmental organizations (“NGOs”). Legislation is an act of making a political statement. The draft bill (the “Bill”) designed to regulate foreign NGOs is an unwelcome message to its target audience. It sounds grudging, presumably because much of the impetus for the intended codification emanates from obsession with national security. In addition to the tone of the Bill, the rules as currently drafted are excessively prescriptive, confusing, and cumbersome. The Bill sends a harsh message. Although the stated purpose of the Bill is “to normalize and guide activities of foreign NGOs within the territories of China, protect their legal rights and interests, and promote exchange and cooperation,” it seems to be conveying a contrary signal on two “push/pull” fronts. First, the Bill provides for a “push disincentive” process by which foreign NGOs shall obtain prior approval from designated Chinese sponsors if they plan to carry out any permanent or temporary activity in mainland China. Second, the Bill proposes a “pull disincentive” process: public security departments are not only registration authorities, but also charged with supervisory, investigative and enforcement authorities and functions specifically targeting foreign NGOs. The proposed approval, registration, and enforcement regime stands in stark contrast to the recently improved system applicable to certain domestic NGOs and foreign chambers of commerce, by virtue of which registration authorities are Civil Affairs bureaus, and no sponsorship is required unless under exceptional circumstances. The Bill also causes profound confusion and uncertainty. Key concepts in the draft law are fatally ambiguous and vague. For instance, the Bill presents a definition of “NGOs” featuring two substantive aspects—nonprofit and nongovernmental, which can be broadly read to cover all entities registered outside Mainland China as non-for-profit, tax-exempt nongovernmental institutions. Meanwhile, the Bill fails to define essential words and phrases such as “activity” (huodong), “public order and good morals” (gongxu liangsu). The poorly defined and vaguely worded text breeds ambiguity and perplexity, thereby hindering, rather than helping, international exchange and cooperation. Moreover, the Bill imposes undue financial, administrative, and operational burdens. The proposed complex review, reporting, filing, and approval procedures will lead to a sharp rise in administrative and operating costs. These factors will strain the abilities of foreign nonprofits to engage in activities conducive to “public welfare” (gongyi shiye), and hamper efficient responses to civil society needs in China. I agree with other commentators that making public security authorities formally responsible for registration and oversight of NGOs, as opposed to merely spying on them, is an unfortunate development. This, and several, vivid references to “investigating and punishing illegal activities” certainly makes the intent appear repressive (although it is the implementation, not the letter, of Chinese law that most matters.) The most able NGO managers might be able to enlighten and turn their security ‘supervisors’ into allies but this would, at best, require a lot of patience, time and effort—and the overall tenor of the draft document points to an atmosphere of suspicion and control in which it would not be easy to build constructive relationships. It will therefore be harder for international NGOs to make a positive contribution to China’s development. However, it is wrong to romanticize international NGOs, wrong to elide or equate NGOs with ‘civil society,’ and very wrong indeed to get carried away with the dream of civil society bringing progressive, democratic government to China in some great surge of citizen power. I have not been in China since 2007, so have no insight into how things may have changed on the ground, but I can see that certain castles have continued to hover in the air. I recall, for example, that the 2011 Arab Spring brought the retiring U.S. Ambassador to China out onto the streets of Wangfujing, to see if the revolution was starting there too. This kind of thing, and all the talk about, for example, “whether environmental NGOs in China might be harbingers of wider political change” (as Elizabeth Economy wondered aloud in her book, The River Runs Black) suggests to me that as long as the West continues to dream this way (despite the lack of evidence that NGOs have ever catalyzed a successful and democratic social revolution anywhere), the Government of China will treat international NGOs with suspicion. And that’s a shame because there’s so much really interesting and useful joint work that Chinese and international organizations can do on issues ranging from agroforestry to social policy and service delivery for older people. I never thought I would look back at the early 2000s as a relatively open and “easy” period for international cooperation on rule of law and human rights with China. Work in this area has never been easy nor straightforward, but the government used to recognize that China could benefit from learning about international standards and from other “developed countries”. The legal grey zone described by Isabel Hilton above allowed for for creative tensions between established GONGOs (that is, Government Organized Non Governmental Organizations) and grassroots NGOs, for Chinese policy entrepreneurs, and civil society organizations to emerge, and for international collaboration addressing social, environmental, and legal issues. This landscape has changed dramatically since Xi Jinping came to power. With the new law on foreign NGOs, China seems to be reverting back to the days when the Communist Party deemed any Western organization as suspicious, and saw “non-governmental” as akin to “anti-goverment”. Teng Biao is right to point out this is not really an aberration from the CCP’s overall attitude towards civil society. What is new, however, is that the previous cycles of increased restriction—followed by periods of relative relaxation—have turned into a permanent and comprehensive drive to isolate and marginalize dissenting voices and independent NGOs. This drive has been underway for several years. China is much less inclined to take advice or criticism from the outside than it was a decade ago, and international criticism of China’s human rights record has been toned down in step with China’s growing commercial importance. Deng Xiaoping once said of economic reform that when you open the window, you also have to let a few flies in. The new law on foreign NGOs would shut out both flies and fresh air. It also fits badly with government efforts to address the root causes of social unrest through increased public participation and transparency. Public protests—against land grabs, house evictions, environmental degradation, and factory lay-offs—are increasing in China because citizens lack legal and legitimate channels to seek redress and participate in public decision-making. The ever-increasing costs for domestic security to maintain “stability” has prompted a debate in China about the need to find more effective ways to resolve social conflicts. New guidelines call for improved stakeholder dialogue and increased public participation. Recent years also have seen a policy shift in Chinese overseas investment, requiring Chinese enterprises to respect local communities and fulfil social and environmental responsibilities. Some Chinese companies are beginning to see the value of stakeholder engagement and collaboration with international NGOs as a way to address social and environmental issues. China also would like Chinese GONGOs to play a bigger role in international humanitarian assistance. The new law on foreign NGOs doesn’t sit well with these international ambitions, nor with Premier Li Keqiang’s pro-innovation, anti-bureacracy rhetoric. Even if the CCP does not believe in the intrinsic values of freedom of association, it should be able to see the long-term instrumental value of public participation and international collaboration for a more sustainable and innovative Chinese economic development model. I wonder whether this draft legislation really represents a serious deterioration in the legal status of foreign NGOs. A bit of Googling on the pre-existing state of the law quickly yields a number of studies that argue, essentially, that the specter of arbitrary police interference and highly ambiguous administrative review has always hung over foreign NGOs—including both politically sensitive ones and the more “innocuous” ones that Carl identifies. See, for example, the summary provided in this 2009 paper from the "Washington University Global Law Review": Even before the current draft legislation was circulated, “without legally registered representative offices, foreign NGOs were not allowed to admit members or raise funds in China.” Moreover, registration processes were highly ambiguous in the absence of formal legislation, and few NGOs, apart from those with senior government connections, were shielded from police oversight and interference. This new draft legislation would eliminate some of the ambiguity surrounding issues such as registration, and does not seem to either add or subtract significantly from the amount of power wielded by public security organs. Seen from that perspective, it arguably lowers, rather than increases, the administrative costs of conducting operations in China, insofar as it provides a somewhat clearer roadmap of the legal and administrative hurdles that one must overcome. The differential treatment of politically sensitive NGOs and more “friendly”/“non-threatening” NGOs under the previous legal regime can also be expected to continue under this new (draft) regime: A university seeking academic collaboration will likely have a fairly painless experience, whereas a rights-advocacy organization will probably not—but this has, again, always been the case. All things considered, it may actually be possible to argue that this draft is a moderate improvement upon current legal institutions. Even so, the draft, if formally approved, could still have the social chilling effect that the previous discussants have raised. It draws greater public attention to the costs and risks of operating an NGO in China, and may deter some entities that previously had a more optimistic (but inaccurate) view of things. I would like to believe that such blind optimism has driven only a small portion of foreign activity in China—and therefore that the chilling effect will be minimal—but this may be blind optimism on my part.